The stocking in 2016/17 bought the estimated numbers of carp in the water to nearly 1,900. The water holds a good number of carp in excess of 20lbs and a number of different thirties have been caught, the biggest just over 40lb. As in our other waters the carp continue to put on weight rapidly. Good numbers of perch and pike are also known to be present along with a few tench and bream. Brasenose-Two is also a popular destination for specimen roach anglers, with 2lb plus roach caught regularly. Linear's largest carp water and one to watch. We now estimate the carp stock to be around 1,900 fish. 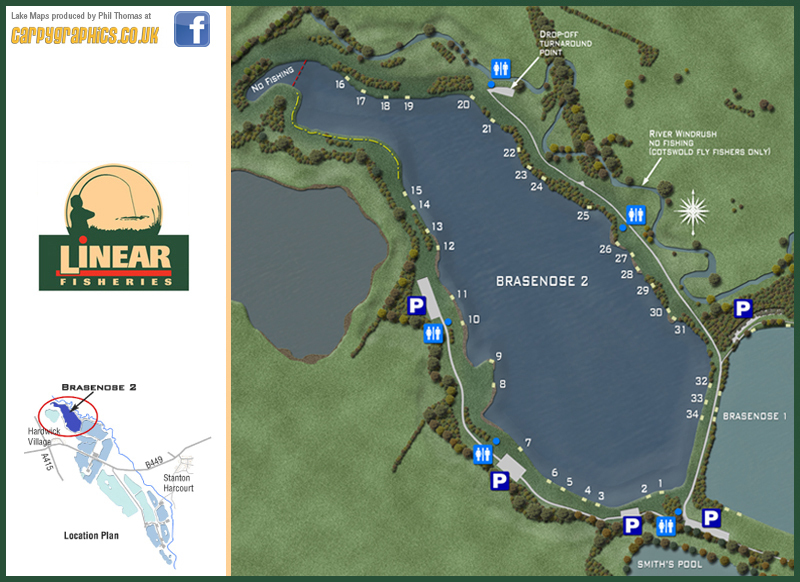 A high percentage of the fish stocked have been commons, fully scaled and linear scaled, all of which are maturing rapidly and already Brasenose Two is starting to rival its sister lake Brasenose One as a runs-water. In recent years many more anglers began to enjoy some remarkable multiple captures and a high percentage of these fish included twenties. Records now stand at over 40lb for a mirror [caught in 2015], 33lb for a common and 30lb 01oz for a ghost carp. There are many more gravel bars and features in this water than any others on the site; for this reason we highly recommend that, to save you losing fish and for their welfare, leaders are used at all times. In some swims short 6-8ft leaders can be effective but we would recommend that you use two to three rod lengths of leader to help prevent cut-offs. When using leaders you must ensure that your lead can pass over any knots and be discharged, or failing that use drop-off in-line leads. *Failure to make your leaders and rigs safe could lead to you being asked to leave the complex. If you're unsure then ask a bailiff. This also applies to all our other waters where unsafe end tackle is being used - see rules. As with the other day ticket waters the stocking policy on the Brasenose Two Lake is on - going. We plan to introduce more carp in the future and these fish are currently being raised in our stock ponds.